John Brodie was selected 3rd overall in the 1957 NFL Draft by the San Francisco 49ers. He landed the starting quarterback job in 1961 and thrived in that role until his retirement in 1973. In 1970, Brodie stood out as one of the best, leading the NFL with 24 touchdown passes and earning the NFL’s Most Valuable Player Award. The 2-time Pro Bowl selection ranked third in career passing yards when he retired in 1973. Brodie is a member of the College Football Hall of Fame, and his jersey #12 has been retired by the 49ers. 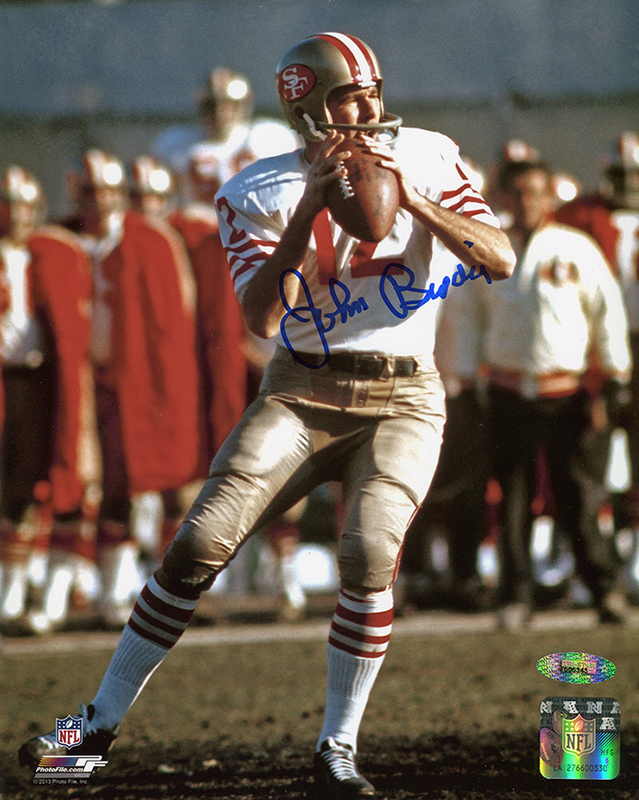 This San Francisco 8x10 photo has been personally hand signed by former star quarterback John Brodie. Each autographed photo includes an individually numbered TRISTAR Authentic hologram.